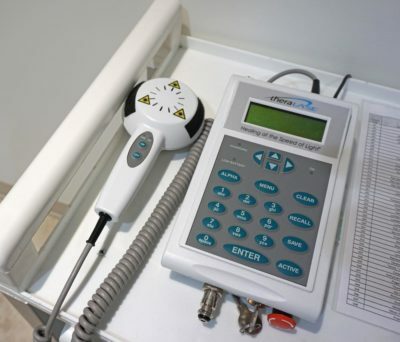 Cold Laser Therapy (also called Low Level Laser Therapy or LLLT), can be an effective and non-invasive treatment that uses energy in the form of laser light to stimulate the body’s own natural healing process. It is a painless, sterile, non-invasive, drug-free treatment which can be used to treat a variety of pain syndromes, injuries, wounds and fractures. This low level “cold” laser light can penetrate the skin’s surface and stimulate the underlying tissue to increase blood circulation. Light is transmitted through the skin’s layers (the dermis, epidermis and the subcutaneous tissue or tissue fat under the skin) at all wavelengths in the visible range. However, light waves in the near infrared ranges penetrate the deepest of all light waves in the visible spectrum. When low level laser light waves penetrate deeply into the skin, they optimize the immune responses of our blood. This has both anti-inflammatory and immunostimulate effects. It is a scientific fact that light transmitted to the blood in this way has positive effects throughout the whole body, supplying vital oxygen and energy to every cell. The result is a reduction of pain, swelling and inflammation along with increased tissue. This in turn leads to quicker healing. 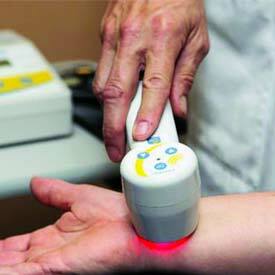 Cold Laser therapy can be used either on its own or in conjunction with other therapies. book your Calgary Cold Laser Therapy consultation appointment today!